Yum. One of the perks of having your kid play soccer in the Hispanic soccer league. The food. Besides the Chicharrón, you have what our family calls “corn-in-a-bowl” or, if you like it on the cob, “corn-on-a-stick.” Either way, it is yummy. 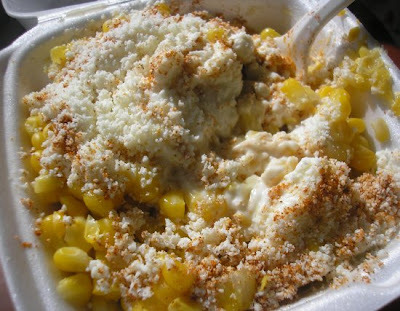 Corn, mayonnaise, cheese and chili. I’ll admit, the first time I saw it made (a few years ago), I was skeptical. I mean, the mayo was sitting out, unrefrigerated for what was probably hours in hot Wisconsin weather. I gave my husband the “poopy-pants” look that we give when at potlucks, picnics and questionable restaurants. The, that-doesn’t-look-like-it-follows-safe-handling-food-guidelines-and-there’s-a-good-chance-of-poopy-pants-if-we-eat-this” look. But it smelled so good. And it was hot. And, a little diarreah every now and then is like a free colon cleanse, right? It’s not like every kid on the field was running around with poopy pants… it had to be safe. Right? Or are their stomachs are conditioned to mayo off the shelf? In a moment of weakness, we bought, we ate, we fell in love. We never looked back. I don’t get the corn every time we go. The kids do get the chicharrón quite often, though, using so much hot sauce it is like pork skin cereal. There’s a salad that looks extra yummy. I thought it was seafood on top of a crunchy chicharrón with lettuce, avocado… turns out the translucent slivers peppering the entire salad are thin slices of pork fat. I can’t get into it. We’ve made the corn-in-a-bowl at home and it is very good. But there’s something about getting it served after (before or during) a game in a styrofoam bowl.